A police force has apologised to a blind grandfather who was shot in the back with a 50,000-volt taser stun gun after officers mistook his white stick for a samurai sword. Two-time stroke-victim Colin Farmer, 61, said he thought he was being attacked by muggers when he was hit with the weapon by the officer, who then handcuffed the retired company director as he fell to the ground. Officers had been dispatched to Chorley, Lancashire – where Mr Farmer had been on his way to meet friends for a drink in a local restaurant – following reports of a man armed with a sword roaming around the town centre. Mr Farmer, who has suffered two strokes in the past, claims the taser could have killed him, and said he wants the officer responsible ‘sacked, charged and locked-up’ after his ‘real-life nightmare’. The father of five, who has two grandchildren, has made a formal complaint and said he intends to take legal action against Lancashire Constabulary, which has issued an apology and launched an investigation. He was using his stick to make his way down Peter Street in Chorley when he was spotted by the unidentified officer, who wrongly assumed he was the swordsman. The PC claims he called to Mr Farmer to stop, but when he carried on walking ahead the officer fired his weapon only to realise his mistake. The 61-year-old was taken to hospital for treatment and later released. 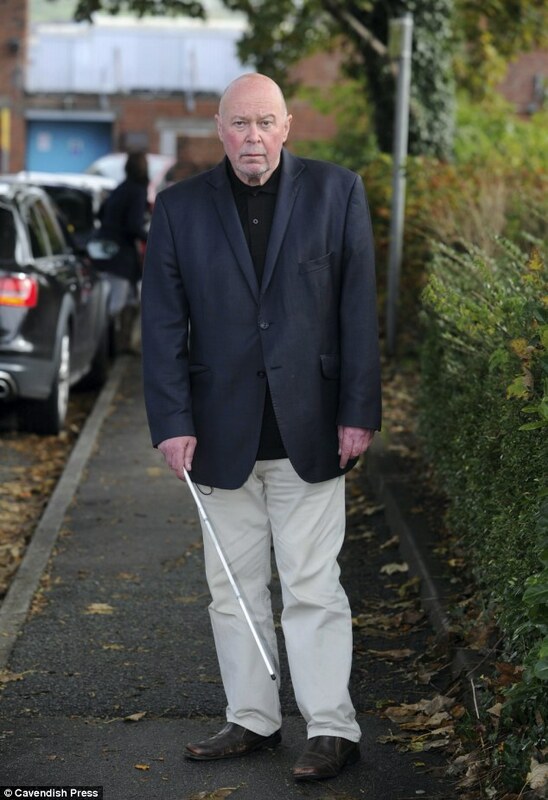 ‘I want this officer sacked, charged and locked up because there is no excuse whatsoever for attacking a registered blind and disabled retired man without warning and with such a potentially lethal weapon,’ said Mr Farmer, who used to run an architects’ firm. This taser could have killed me and if something happens to me a result of the shock I got, I hope the officer will be done for manslaughter. Mr Farmer, a Fellow of the Institute of Directors for 20 years, described hearing shouting as he walked along the street at around 5.45pm on Friday. I was just shuffling along, I didn’t see anybody or anyone I was just looking down at the floor watching where I was going and my only concern was meeting my friends,’ he said. ‘I heard this male voice shouting and and bawling at me from behind and I became frightened because I thought I was about to be mugged. ‘Obviously I am the perfect target for muggers because I don’t know what is going on around me and I carried on walking in the hope I would get away. ‘The next thing I knew I felt this thump in the back I felt this huge electric shock. It was like thousands of volts going through my body. ‘I thought that I was honestly going to die and they were going to kill me. All my muscles turned to dust and I thought I was having another stroke. After hitting his head on the ground, terrified Mr Farmer desperately tried to explain to the officer that he is blind. ‘I said ‘I’m blind, I’m blind. I’m blind’ but this policeman knelt on me and dragged my arms round my back and handcuffed me so tight I’ve had bruises since. ‘I said ‘you’re hurting me, I’m blind’ – and there’s no way he could not have seen my stick on the floor,’ Mr Farmer added. The 61-year-old said it should have been as ‘plain as a pikestaff’ to officers that he was ‘no threat to anyone’. ‘I didn’t know it was the police who were behind me but then I don’t know why there was an urgency in them pulling that trigger, they did not have to do it,’ he said. ‘It’s ridiculous because across from the local police station there is a blind centre so the police must think there is a queue of people with swords if they thought that me with the walking stick was a samurai sword. ‘I was left with bruises and cuts and I fell forward straight onto the gravel and banged my head. ‘He used such force when putting the handcuffs on that he broke a small bracelet which was a family heirloom which belonged to my grandfather during the First World War. ‘In my opinion this officer was a man on a mission he was going to use that gun no matter what. The stress of this could still kill me in six months if I have another stroke and the police would have blood on their hands. Mr Farmer was taken to Chorley Hospital for treatment after the unnamed officer swooped on him close to the Parmesan and Pepper restaurant in Peter Street. Lancashire Police has said it ‘extremely sorry’ for putting Mr Farmer through the ‘traumatic’ experience. Mr Farmer has suffered two strokes – one in November 2008, which left him blind and partially paralysed down one side, and a second following a brain hemorrhage in March this year, which left him in hospital for two months. Chief Superintendent Stuart Williams, of Chorley Police, said the matter had been referred to the Independent Police Complains Commission. ‘On Friday evening we received a number of reports that a man was walking through Chorley armed with a samurai sword,’ he said. Chief Supt Williams said officers attended to Mr Farmer ‘straight away’ when it became apparent he was not the offender they were looking for. ‘He was taken Chorley Hospital by police officers who stayed with him whilst he was checked over by medics. They then took him to meet his friends in Chorley at his request. ‘Lancashire Constabulary deeply regrets what has happened. We have clearly put this man through a traumatic experience and we are extremely sorry for that. ‘Officers have remained in contact with him and his family over the past few days to enquire about his recovery and we will continue to keep in touch with him and keep him informed of our inquiry. Following the incident a 27-year-old man was arrested in Chorley on suspicion of possession of an offensive weapon, but police later released him without charge. It is not the first time the use of tasers by police officers has caused controversy. In May police officers shot Alzheimer’s sufferer Peter Russell with the stun-guns in front of his wife after they were called to his North Lincolnshire home to help bring him to hospital. Confused Mr Russell had lashed out at police when they arrived to take him away, prompting them to fire several taser stun rounds before tying his arms and legs together and carrying him out to the waiting police van. Mr Russell’s wife Diane lashed out at the officers’ treatment of her ill husband, who she said ‘wouldn’t hurt a fly’. But the officers’ actions were backed by police chiefs. In June this year the Police Federation wrote to the Prime Minister to demand that every front-line officer be armed with a taser. There are currently 12,000 on our streets, but under the Police Federation plans that number would be increased to 36,000.